Runner-up Zach Child, front, and winner Benjamin Rands were the final two out of 54 contestants Feb. 25 in the Times-News Regional Spelling Bee competition at the Kimberly Elementary gymnasium. Parents and family wait for the Times-News Regional Spelling Bee to begin on Monday night at Kimberly Elementary gymnasium. Fifty-four contestants participated in the event with three main trophies and the chance to compete in the national Spelling Bee near Washington, DC. Judges give words to kids that participated in the Times-News Regional Spelling Bee Monday night at Kimberly Elementary School. Benjamin Rands was the winner of the Times-News Regional Spelling Bee Monday night at Kimberly Elementary School. Benjamin Rands, front, was the winner of the Times-News Regional Spelling Bee on Monday night. Zach Child came in second on the final round of the tournament. Benjamin Rands, winner of the Times-News Regional Spelling Bee, is interviewed Monday by emcee Daniel Gardner. Benjamin, a student at Vera C. O'Leary Middle School out-spelled 54 kids from around the valley at the event. TWIN FALLS — Fifty-four entered, but only one could be crowned the winner. Thirty-five spellers made it to round two. Only seven were remaining by round four. By round seven, only two were left. Benjamin Rands and Zach Child had a battle of minds that would last until one spelled two words correctly. The tug-of-war raged until round 15. Child messed up on the word bole, it’s of Norse origin and it means the trunk of a tree. Rands’ final word was quadrille — a square dance performed typically by four couples. It has a Latin origin. And there was a new winner. Rands, a seventh grader from O’Leary Middle School, will represent south-central Idaho at the Scripps National Spelling Bee May 28-June 3 in National Harbor, Md. It was the furthest that Child had ever made it in a spelling bee. The eighth-grader from Kimberly Middle School said that it was a mind-numbing experience and he couldn’t believe he made it that far because at a certain point he just had to guess for certain words. In total, 53 students in first through eight-grades from 28 south-central Idaho schools competed in the fifth annual Times-News Regional Spelling Bee on Feb. 25. 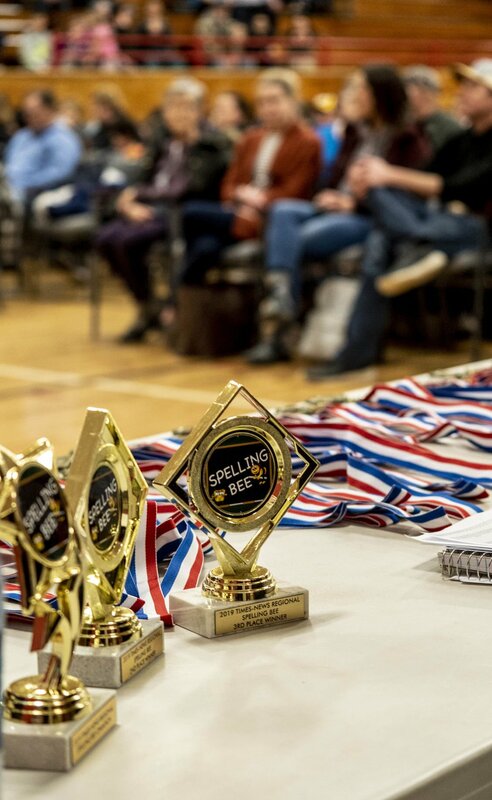 Each participating school, depending on its size, sent its top two or three spellers to the event. Clark Draney, a professor and head of the English language and philosophy department at the College of Southern Idaho, was the pronouncer for the event. Each word was selected at random. Students could ask the definition of the word, the country of origin and for the word to be used in a sentence. If a word was spelled incorrectly, a bell would ring and they would leave the stage. Times-News Editor Alison Smith and Times-News reporter Mychel Matthews were the judges on the spelling. Brynlee Eccles, a fifth-grader at Rock Creek Elementary, said that reading helps anyone who wants to be a future speller extraordinaire, but they have to be ready for a nerve wracking experience. Emily Fouts, the winner of last years competition, watched from the audience. She went through three rounds at the national spelling bee. She watches the regional sport now to admire the effort that people put into learning words. After the competition, she went over to the newest winner and gave him tips and tricks for the Scripps National Spelling Bee. They exchanged experiences in spelling bees like old war stories. “What did it feel like when you were on stage?” Fouts asked. “All I could think was don’t mess this up, don’t mess this up,” Rands said.